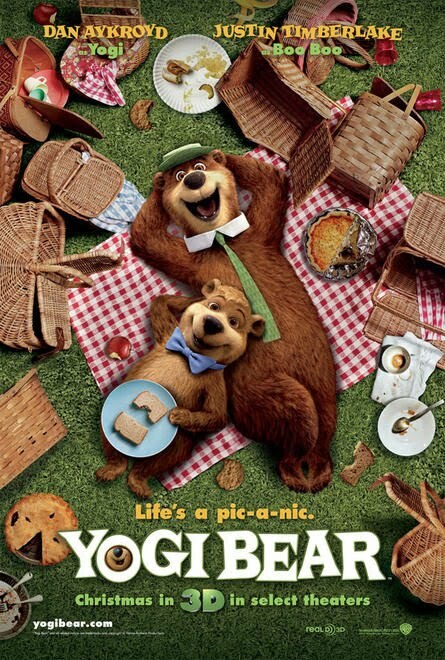 Mendelson's Memos: Yogi Bear gets a poster. This actually screened this week somewhere in LA (don't remember the location), but since my daughter is not between the ages of four and ten, attending wasn't really an option. Not that this one is high on my interest list anyway. I've said this for years, but I still think that Warner Bros is missing a golden opportunity. There's only one Yogi Bear movie I want to see, and it's something more appropriate for Lionsgate or Screen Gems. If you're going to do Yogi Bear, do an R-rated horror picture, involving the seemingly quaint Jellystone Park being terrorized by an apparent father-son team of murderous bears. Ranger Rick is brought in to deal with the bloodshed, as no one wants to close the park during prime tourist season. But Rick soon learns that this murderous duo is in fact smarter than the average bear. "This Christmas... pray he only steals your pic-a-nic basket."